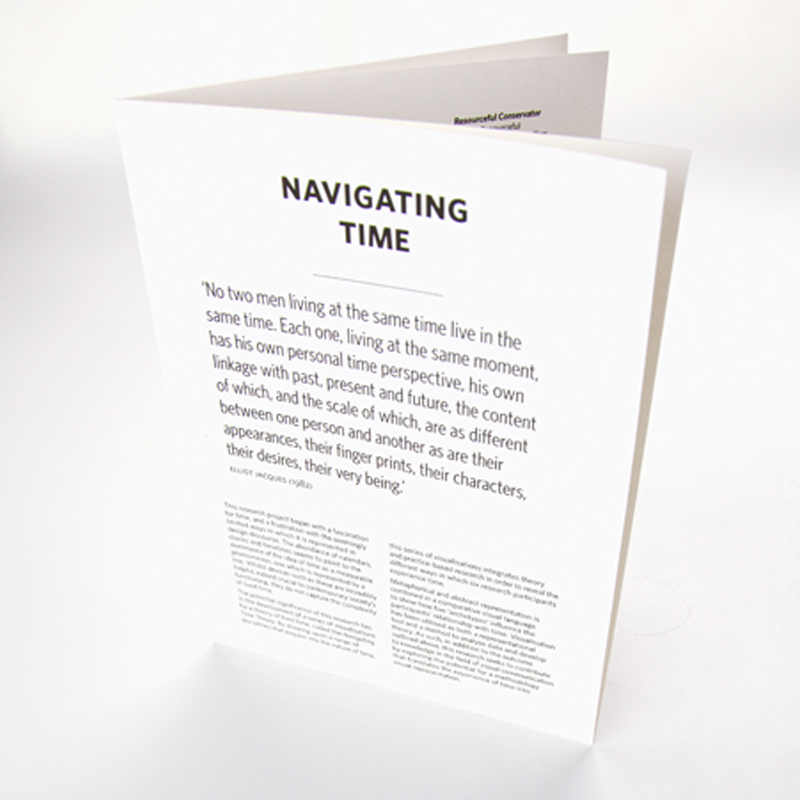 Navigating Time is a research project which explores how different individuals experience time and how it might be possible to visually map these experiences and compare them. The work was completed as part of a two year Design Masters (by Research) at Monash University, Melbourne in 2012. 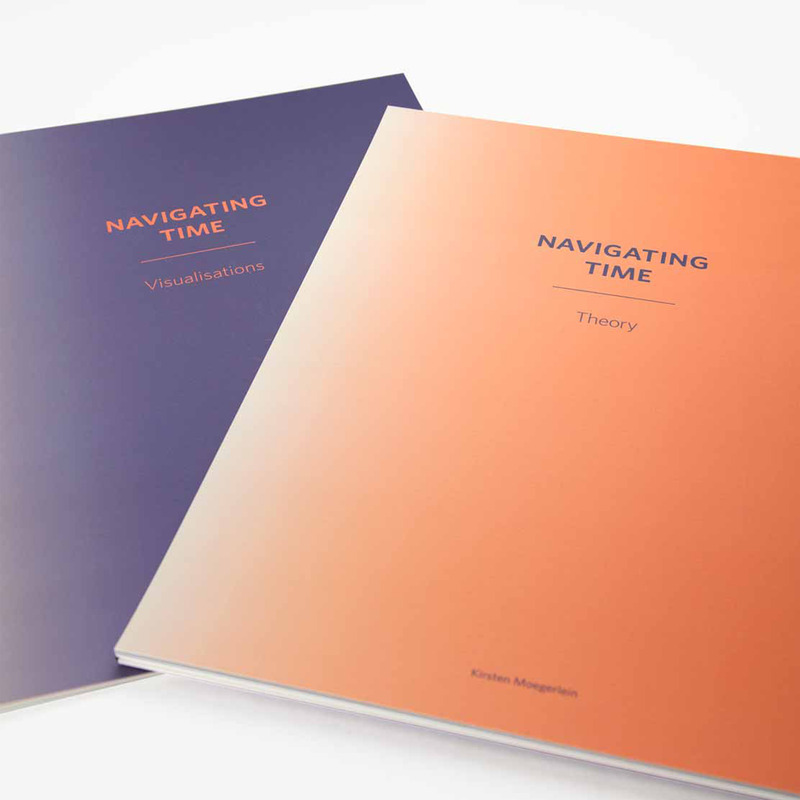 For a more detailed account of the research you may download the Navigating Time Theory publication here. The experience of time is complex; it differs between individuals and greatly affects our attitudes to life, yet we typically lack the means by which we might recognise and discuss these differences. This research project began with a fascination for time, and a frustration with the seemingly limited ways in which it is represented in design discourse. The abundance of calendars, clocks and timelines seems to point to the dominance of the idea of time as a measurable phenomenon, one which is represented by a line. Whilst devices such as these are incredibly helpful, indeed crucial to contemporary society’s functioning, they do not capture the complexity of lived time. The potential significance of this research lies in the development of a series of visualisations for a theory of lived time, called the Navigating Time Theory. By drawing upon a range of disciplines that enquire into the nature of time, this series of visualisations integrates theory and practice-based research in order to reveal the different ways in which six research participants experience time. Metaphorical and abstract representation is combined in a comparative visual language to show how five ‘archetypes’ influence the participants’ relationship with time. Visualisation has been utilised as both a representational tool and a method to analyse data and develop theory. As such, in addition to the outcome outlined above, this research seeks to contribute to knowledge in the field of visual communication by exploring the potential for a methodology that translates the experience of time into visual representation. In recognising that existing visual representations of time are largely unable to shed light on the experience of time, this research sought to develop visuals that might capture a more complex picture of lived time. This desired objective necessitated the involvement of research participants, whose presence added a social dimension that other representations appeared to lack. The research conducted by Zimbardo and Boyd (2008) provided evidence in support of the claim that people experience time differently; the involvement of participants in this research enabled an exploration of these different experiences. These factors suggested that a qualitative approach, which drew upon both design and social science research methods, was most appropriate. In order to visually represent the social significance of lived time, six research participants, ranging in age from 25 to 67, were individually interviewed and asked to complete three tasks. The first task required the participants to record how they spent their time for the duration of one week in a time diary. The second task required them to ‘draw a picture of time with yourself in it.’ The final task asked them to rank nine metaphors in the order that best described their experience of time. A semi-structured conversation surrounding the participants’ experience of time was also conducted, and a variety of topics were discussed. Once collected, the research data was analysed by combining Grounded Theory and visualisation techniques as part of an experimental methodology. Our experience of time is complex. Any theory or representation of it must acknowledge this complexity. We don’t simply use time; we also view it, structure it, think about it, and reflect upon it. How the participants’ archetypes exert their influence varies. In other words, not all Architects are the same, nor are all Bankers. For example, how the participants viewed the passing of time varied. They therefore do not all share the same type of Surveyor. Some participants viewed the passing of time with an optimistic attitude, and other participants observed the passing of time as neither good nor bad, instead adopting a more detached stance. Variations in each archetype were developed to account for these differences. They are listed below. For a more detailed discussion of each, refer to page 7 & 8. A comparative visual language was developed to represent the six participants’ experiences of time. This approach allows their experiences to be compared, and reveals the different temporal worlds in which the participants live. Two types of representation, metaphorical and abstract, have been used in this research to communicate the Navigating Time Theory. Metaphorical representation is used to communicate the influence of five ‘archetypes’ through a symbolic visual language, while abstract representation is used to communicate additional detail surrounding how the archetypes influence the participants’ orientation and tempo. Combined, these two approaches form a metaphorical vessel, representative of the participants’ experience of time at a particular point in time. In attempting to develop new forms of visual representation for time, this research has explored how visualisations can capture the social significance of lived time. In doing so, it has also explored the potential for visualisation to play a key role in data analysis and the theory building. These approaches combined to open up many new paths for exploration. Indeed, it would appear that this practice-based research has merely scratched the surface of a topic that extends seemingly indefinitely. The visualisation of the Navigating Time Theory is by no means the only solution that could have been suggested. However, its strength lies in its ability to aid our understanding of our experiences of time through a metaphorical communicative tool. Any representation of our experience of time must acknowledge the complexity inherent in this experience. Given the relevance of metaphor to both time and cognition, and its ability to bridge the divide between the visual and the verbal, its application here provides a vehicle to communicate this complexity; in essence, it offers a human solution to a human problem. Finally, as this research was concerned with developing a method to translate the experience of time into a visual representation, as well as producing a comparative visual language to represent the varied temporal worlds that the participants live in, it was outside the scope of this research to refine the theory entirely. Table 1.0 presents the theory diagrammatically, and highlights potential areas for exploration, if future research were to be conducted.